Gould (1-4) posted his first win of the season, giving up a hit over 2 1/3 scoreless innings of relief. Gould relieved Cole Evans in the eighth and with two outs and a runner on second and struck out Dodge City’s Cameron Fritz to end the inning. The Saints came back to tie it in the seventh on a Cruz Shope RBI single and took the lead at 4-3 in the eighth on a run-scoring fielder’s choice by Caraballo. The lead was short-lived as the Conquistadors tied it in the bottom of the inning. 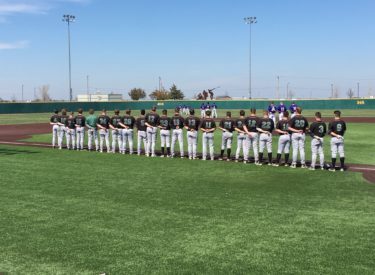 Seward hosts Dodge City Saturday at 1 with game one on kscbnews.net and game two on 1270 and kscbnews.net.